LONDON, April 10, 2019 /PRNewswire/ -- A national survey* reveals that 1 in 3 women across the UK are being shamed for fake tanning. Feeling shame can impact negatively on women's wellbeing, confidence and mental health. A new survey conducted by St.Tropez, the UK's number one and most trusted self tanning brand**, has found that shaming can be a very real part of some women's day-to-day life. So why the shaming? Who is doing it and why? 44% of women admit to judging their fellow females for wearing a sunless tan and over half a million women in the UK have experienced negative comments online, specifically for wearing fake tan. 60% of women who have experienced judging looks and insults say that their confidence was seriously knocked, they went straight home, and they did not wish to leave the house. Whilst 70% of the women surveyed admit a badly applied tan is the number 1 reason they judge another's appearance. Shocking. In an age where positive body confidence messages are high on the agenda in schools, the workplace and from consumer brands - it appears that it's women who need to start supporting the cause. But, in-spite-of the stigmas, the survey revealed that 42% of UK women who proudly wear fake tan cite their two main reasons for doing so as looking well and feeling confident. In addition, having a post-holiday tan also features in the top 3 confidence boosters, which also suggests that golden glowing skin inspires us to feel our best and on top of our game. 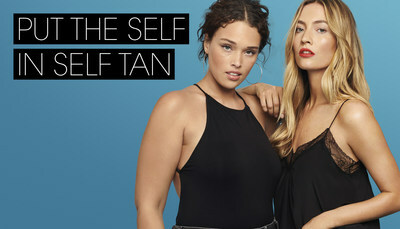 These insights have led St.Tropez to boldly address the stigmas surrounding self tanning head-on, with a motivational campaign entitled You Set the Tone which aims to highlight that tanning is more about how you feel than how you look and a goal of empowering women to feel more confident, every day. Launching on the 10th April, the campaign aims to put the Self back in self tan and has the support of Philanthropist and Charity Founder, Katie Piper, as well as an army of brand fans. Katie said, "I'm backing St.Tropez's You Set the Tone campaign as it's vitally important for women to feel confident in their own skin and with their own bodies, and if a beauty product or regime can help them achieve this, it can only be positive. Every woman has an individual reason for how they wear their make-up or hair and it's no different with self tan. Tanning doesn't just add colour, it can also help to even out skin tone, cover up pigmentation or redness, allow you to wear less make up or go without heavy foundations. The survey findings show that us women need to be supporting and celebrating each other and finding ways to improve our self-esteem and ultimately, our mental wellbeing." St.Tropez is pledging to give women across the UK the tools to feel confident, look glowing and make tan-shaming for bad application a thing of the past with game-changing developments. New St.Tropez Purity Bronzing Water Gel, which sold out within hours of its official launch in February, is a one of a kind innovation that means no-streaks, no-transfer, no-stickiness and no-fake tan smell, and 88% of users** agree. Dr. Paul Evans, St.Tropez Innovation & Technology Director, says, "In developing our St.Tropez Purity Bronzing Water Gel, we knew that poor application and obvious streak marks were non-desirable effects. The gel technology breaks on contact with the skin to release an easily spreadable water texture that results in an even, flawless tan and in our user trials, 85% said they felt more confident with the Gel. It's easy to use and can be applied at any time of day or night, which we know is ideal for our discerning yet busy consumers." Michaella Bolder, St.Tropez Tanning Expert, says. "Self tanning in itself can be a bit intimidating and if the main reason women are being judged on their tan is poor application then St.Tropez are doing everything they can to provide products which are mistake-proof – after all, it's the safest way to tan. Self tanning technology has come a long way from the orange tones, patchy legs, stained hands perception of the past and whether you're a novice or regular tanner, there is a product for everyone. Tanning isn't a one look fits all, for some it's a deep dark bronze but for the majority, it's a natural, healthy post-holiday glow – but most importantly, it's one that suits them. It's empowering to be able to offer women that feeling of confidence and positivity all year round. The Purity Bronzing Water range is so easy to use, it's virtually impossible to apply it badly. I am proud to be working with a brand that champions women and You Set The Tone is the first step to ending the stigmas associated with tanning for good." Enough of the judgement. St.Tropez boldly empowers women to set their own tone. ** IRI MAT 52 Sept 2018 & Kantar Awareness Survey 2018, sample size of 521 women aged 16-64.